Watch this video clip and then decide. Strategic Opportunities - We are constantly researching to find projects that are part of a larger strategy to reach the world for Christ. Kentucky Baptists have an exciting opportunity to serve in domestic missions through a three-year partnership between the Kentucky Baptist Convention and the Baptist Convention of Maryland/Delaware. The partnership will focus on strengthening existing churches, associations, and state convention ministries. In a real sense the Baltimore-Washington corridor has become the modern day equivalent of NT Rome. We are asking you to come and help to literally transform one of the most strategic areas in the world through the power of the Gospel of Jesus Christ. Today in Poland, a generation of young adults is living in a country completely different than the one in which their parents grew up. In a nation once dominated by oppressive government, there are now freedoms and opportunities unknown to previous generations. Today in Poland, God is moving among these young adults with the message of a personal relationship with Jesus Christ. Tom Baker has been part of this movement since 1998. Through Across Ministry, Tom and his wife Beata are working to take this message all across Poland. Joining God in His work in Poland, at this unique time in it’s history, to reach this generation of young adults, and their children, and bring them into a deep, daily, personal relationship with Jesus Christ! Kentucky Changers goes way beyond your typical “summer camp” experience because it challenges Christian youth to become “On Mission” Christians. Because Kentucky Changers is a mission process, it will be a challenge for young and old believers to live out their faith while getting their hands dirty doing hard work. Kentucky Changers is a hands-on, youth oriented, “On Mission” experience existing to impact the world of all participants. Participants will work on exterior home repairs for low-income families identified by the partnering local government housing authority, as well as community development projects in the participating Baptist associations. Participants become personally involved in this intense week by making themselves available to be used. Participants will discover and live “missions as a lifestyle and not a location” as they make a difference in their world. Most prison ministries focus on meeting the spiritual needs of inmates while they are incarcerated. In addition to meeting spiritual needs of inmates during incarceration, New Beginnings Transition Homes, a branch from, and affiliate of a long-standing jail/prison ministry, focuses on meeting the spiritual and physical needs of Christians when they are released into society. Most of these men and women possess nothing, very often not even a place to live. This creates the puzzle that we are trying to put back together. Over 17 years ago the work inside the local penal institutions quickly became community based. Volunteers from many churches in the community became a vital part of this work. In 2004 a SUPPORT GROUP was established (with the vision of eventually forming a residential home for those coming out of incarceration). In the meantime, an OUTREACH TEAM was formed, and NOW, the TRANSITION HOME vision is quickly coming into focus. New Beginnings Transition Homes is a family based, post-prison ministry providing a Christian family home for believers upon their release from jail or prison. This fellowship and family setting is coupled with discipleship using Biblical principles and mentoring by local church members. 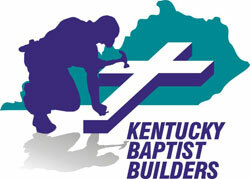 The purpose of Kentucky Baptist Builders is to be a spirit-led partner with local Baptist churches and associations by providing resources with integrity through volunteerism that enables churches and associations to fulfill their God-given vision and to assist them in accomplishing what they could not do alone. This program seeks to provide consultation to churches as they explore the possibility of building, and to determine if using volunteers is a viable option in the building process. The Baptist Builders Program is often able to save churches a significant amount in the building process. Kentucky Baptists are part of a larger network of Southern Baptist volunteers trained to respond to disasters by manning mass feeding operations, using chainsaws to clear downed trees and limbs, clear mud out of flooded homes and more. Southern Baptist disaster relief volunteers work in conjunction with other organizations such as the Salvation Army, the American Red Cross and the Federal Emergency Management Agency. As a whole, Southern Baptists compose the third largest relief organization in the United States. Mississippi River Ministry, a Southern Baptist ministry, is a partnership of the area’s eight state conventions (Arkansas, Illinois, Iowa, Kentucky, Louisiana, Missouri, Mississippi, Tennessee), the North American Mission Board and Woman’s Missionary Union. Southern Baptists are working together to provide ministries, evangelize, strengthen existing churches and start new churches in over 165 counties and parishes of the MRM region. Appalachian Regional Ministry is a Cooperative Program ministry of eleven Southern Baptist State Conventions in the ARM region in partnership with the North American Mission Board and the Woman's Missionary Union. Appalachian Regional Ministry is an intentional missions response to the spiritual and physical needs of persons living in the Appalachian region to mobilize Southern Baptists and their resources to provide ministries, to evangelize the lost, to assist existing churches and to start new churches in the multi-state region of Appalachia.